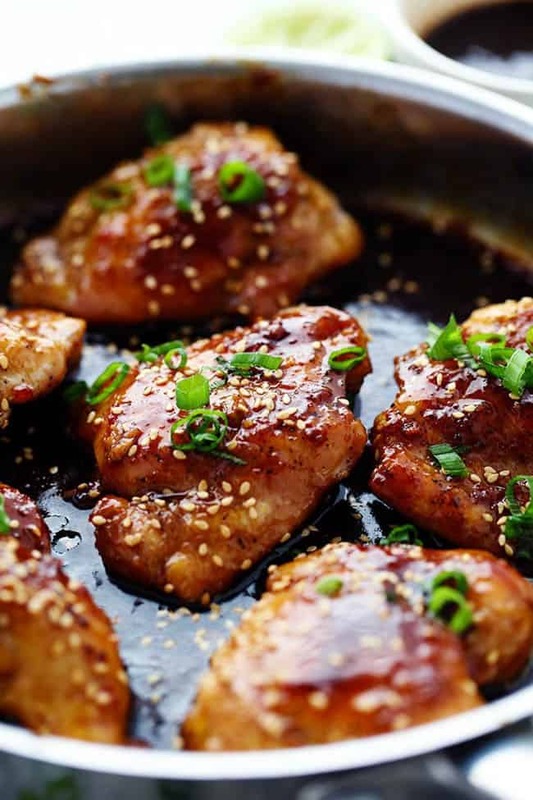 Tender and juicy chicken breasts that get coated in a sticky sweet asian sauce. This meal is ready in just thirty minutes and the flavor is awesome! Isn’t life just so dang busy? And now that it is starting to warm up outside we soak up the sun any chance that we can get. But if there is one thing that I alway try to do is have a meal ready for my family each night. We really do enjoy coming together at the dinner table and talking and joking around. So I really love when I am able to create an easy and delicious meal! You have probably noticed by now that I love asian flavored meals on the blog. Some of my most popular recipes are asian inspired dishes and they are to die for. My favorite food is Chinese and I have been able to create restaurant quality dishes in my kitchen. This meal instantly became one of my top five asian recipes with the first bite! The sticky and sweet sauce on these bad boys is absolutely incredible. 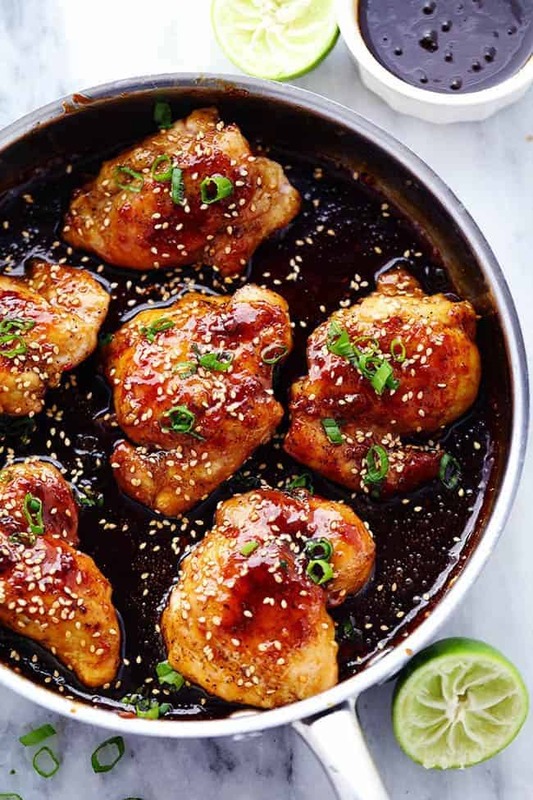 It is made with a delicious sauce of soy sauce, hoisin sauce, sweet chili sauce, brown sugar and a squeeze of a fresh lime. Don’t all of those flavors combined sound amazing? 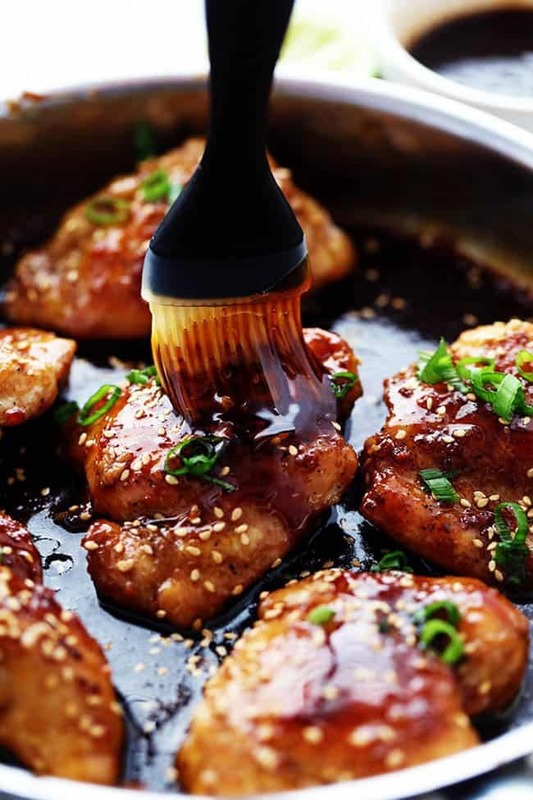 I love how thick and sticky the sauce is glazed over the chicken. And the very best part… it is ready in just 30 minutes. So you are able to bring a delicious asian inspired meal to your family in no time at all! Our family absolutely loved this meal! Everything about this meal turned out perfect. 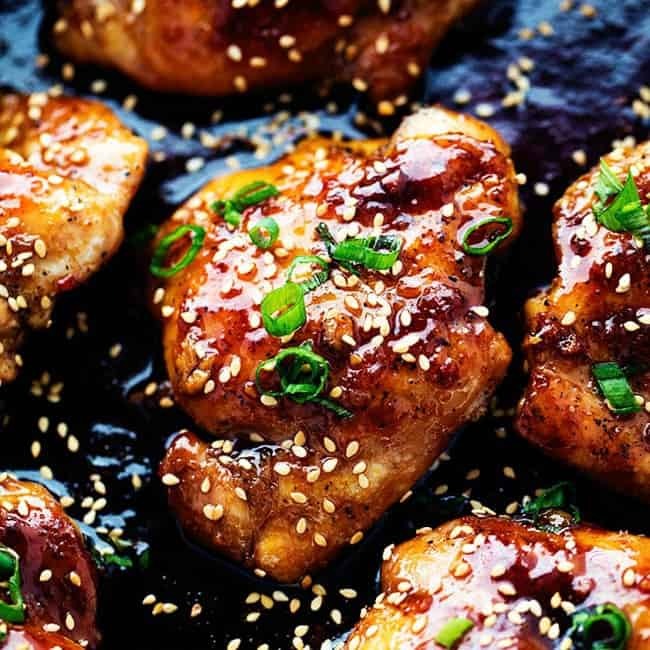 From the tender and juicy chicken to the sticky and sweet asian sauce. 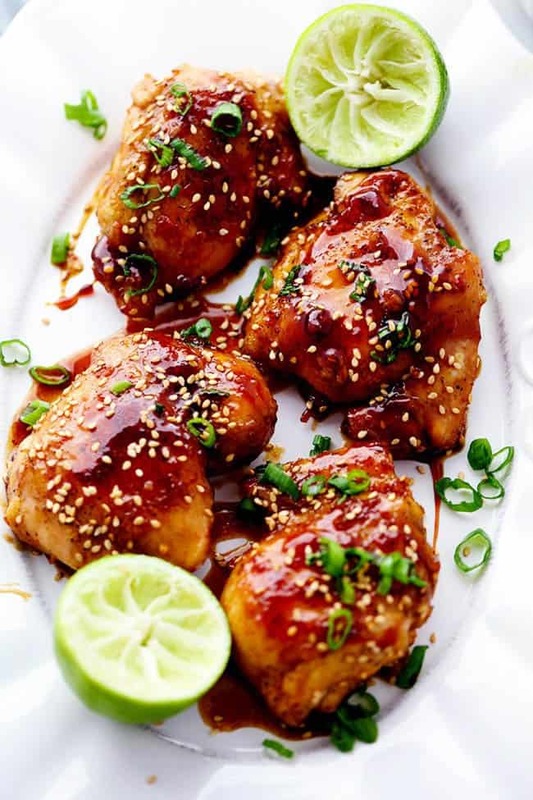 All you need to do is garnish with some sesame seeds and chopped green onions and you have an easy restaurant quality meal right at home! Heat a large skillet over medium high heat and add 1 Tbs of olive oil. Add the chicken and salt and pepper. Cook chicken about 3 minutes on each side or until thermometer reads 165 degrees and brown on each side. Set chicken aside on plate. * I like to use thinly sliced chicken breasts if I am pan frying them so they cook quickly and evenly. But in this recipe I used regular boneless chicken thighs. Hi! Your recipe reads “pound thinly sliced chicken” breast or thighs, but you clearly have not done that in the photos. How does this discrepancy affect cooking times? Looks delicious. I think it means you use 1 lb of chicken. Sorry I should clarify that in the instructions. I like to use thinly sliced chicken breasts if I am pan frying them so they cook quickly and evenly. But in this recipe I used regular boneless chicken thighs. Do you have to use green oinons and sesame seeds? The sauce in this recipe is scrumptious. I’m not used to cooking thighs and I was afraid I overcooked them a tad (or maybe the texture is just different from white meat). I can’t wait to try this recipe again. Truly delicious! Hi, I have made this a couple of times in the last few weeks. It is delicious! I have a problem getting it to thicken though. I cannot for the life of me figure out what I am doing wrong. The flavor is great, I just want it to coat the chicken better. Any advice? Use either corn starch or all purpose flour at a thickener. So, what I would do is scoop a tablespoon of either flour and mix it with some water until both is well combined (it should be more liquidity then thick like a paste). Pour or scoop a small amount to your sauce, mix well–once it reaches to the thick constancy that you want, stop and turn off fire. The sauce in this recipe is delicious, only it has enough heat that you really don’t need to add any more red pepper flakes! My sauce didn’t get that thick, but still…VERY tasty! This recipe was great! 5 stars! I am making it a second time in three days! My whole family loved it! This chicken recipe is my family’s new favorite. Super easy to make and double, or triple. Delicious. Thanks for sharing. Delicious! Not quite as sticky as I thought it might be, I’ve just got to make a couple of tweaks to suit my equipment and pallet. Thanks so much! Delicious recipe!!! The sauce came out absolutely thick and sticky!!! I used half a cup of brown sugar because 3/4 cup seemed a lot but it still came out great! Do you think i can use the sauce on pork? Thank you very much, all the best!!!! This sauce was so delectable I was licking the spoon! I made it with bone-in thighs but also threw in some chicken wings. Next I will try in on some boneless breasts with skin on. Probably would be great with beef and pork too! Tweaks: Instead of red chili sauce I used ketchup (did make it less spicy so I used a tad more pepper flakes). The sauce was also not thickening so I added a slurry of 1tbs of cornstarch and 1tbs of water. So when you use the chicken thighs do you cook it in the oven? Just clarifying since yu said you like to use chicken breasts when you are pan frying the chicken. Thanks! I will definately make this again! We loved it! Thank you! This is an incredible amount of sugar for one recipe. You can use 2 teaspoons of sugar and get the same result. I have and it is delicious without the massive sugar load. Reduce the sugar and it’s a 5. What Can I use in place of hoisen sauce? I don’t have any on hand but I have everything else. Hi, i’m somewhat of a novice when it comes to cooking so wanted to ask a question. 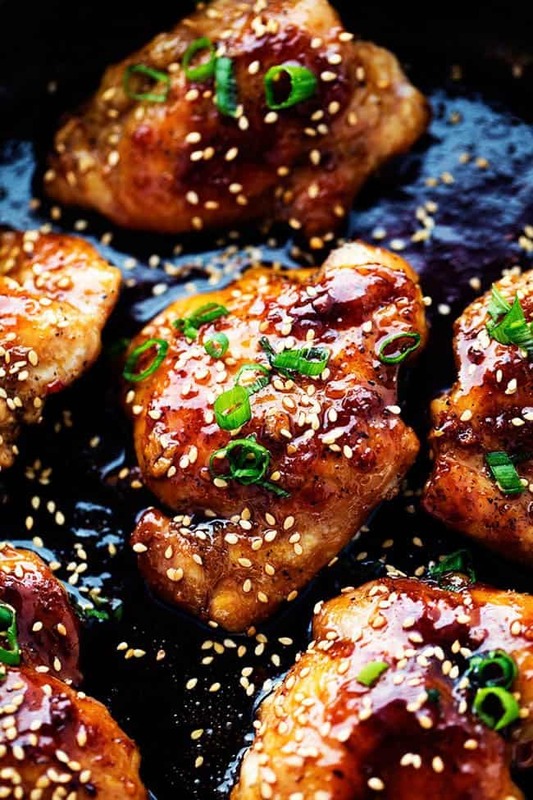 If i wanted to cook 3 lbs worth of boneless thighs than would i just just multiply each ingredient by 3 for the marinade? i.e instead of 3/4 cup brown sugar i would use 2.25 cups? Thanks and recipe looks delish. I have not made this in an instant pot but I would love to know how you cooked it! That sounds like a quick and easy way to make this chicken! Hope that it turns out well for you!